Do you love finding interesting ingredients or new to you produce? Me too! Like a brain teaser, I pick up something new and find out what I can cook with it. Is it a one trick pony or versatile, does it spark some creativity? I also like to support these special, small producers whether at farmer's markets or online. You might have seen this walnut oil as an ingredient in past posts. Small orchard, family dry farmed and soon to be certified organic. I discovered this richly roasted walnut oil last year and after using it in various recipes I am pretty sure you will love it too. We caught up with Olivia from Limerock Orchards at Savor the Central Coast last weekend. There, we chatted about the differences between their California dry farmed walnuts and the imports from France. Yes, like other fine foods, methods and terrior create the conditions of flavor. Walnut oil also has numerous health benefits, rich in antioxidents, copper, magesium and omega 3, 6 and 9 oils. Olivia said that they are also involved in a huge effort to certify their orchard as organic. This is one dedicated family! I couldn't leave their booth without a couple of packages of their pocket-sized bottles paired with gourmet popping corn. One is just for you! 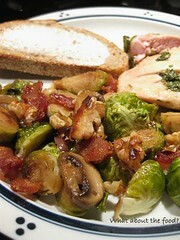 I've also used it to make a great dressing or added to pound cake for a flavor boost. 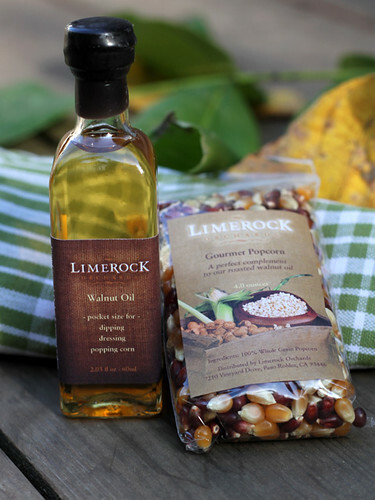 The Limerock Orchard website as recipes too! Here's the scoop: Giveaway will be open until October 17, 2011 and I will pick the winner from a random drawing on October 18, 2011 and announce the winner. Up to 2 chances to win! Open to US entries only, sorry no international entries this time. You must provide an email address either in your Google profile or in your comments. No email, no prize. I continue to enjoy your prose and warm descriptions of comfort foods. Love the flavor of walnut oil but never thought of popping corn with it. Can it be that all your followers are afraid of it? Anyway, sign me up as a commenter! Yummmm--we love walnut oil, too! 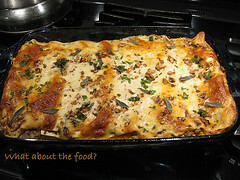 My fav use so far is drizzling over Gorgonzola stuffed endive spears that have been decorated with whole walnuts. I've never used it but would love to try it out! I love walnut oil's nutty flavor and aroma. I am a little hesitant to use it for cooking with very high heat because it becomes a bit bitter. Has anybody experienced the same thing with walnut oil? I hope you do it is delicious! you are so right, walnut oil is not for cooking on high heat. Fine nut oils are better for finishing and a drizzle. "Once you've invested in an artisanal nut or seed oil, treat it well. Use it as you would a fancier olive oil, for finishing dishes—a drizzle on pasta here, a swirl atop a bowl of soup there—but, with a few exceptions, like argan oil, never for sauteing. High cooking temperatures would damage the delicate aromatics. It's also a good idea to keep these oils in the refrigerator to further protect those redolent qualities." Walnut Oil Giveaway has a winner!